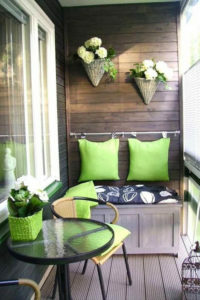 Porches and Patios should set the scene for the style, colours and feel of your home. Does your porch offer welcoming first impressions? The porch sets up the feel and styling of the home, it expresses your personality and should offer a welcoming feeling to visitors. The tone you set at the front door should be carried through the home and flow out comfortably onto your roofed patios. You can create the perfect hub for welcoming family and friends to your home with these awe-inspiring design ideas that ooze style and comfort. Believe it or not there is a difference between porches and a patios. A porch is a constructed extension of your home that is sheltered from the weather by a roof. It is the perfect solution for relaxing and entertaining because you have protection from the sun and rain but can still enjoy your gardens. A porch generally doesn’t have a roof and offers more of a courtyard feel. Both porches and patios can be key architectural features that add great appeal to your home if well designed. While not all porch designs can be carried through to your patio, you can still carry the over-all feel of your entry porch into a stylish extension of your patio. 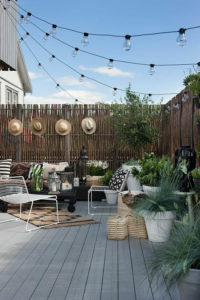 Here’s some simple and easy ideas for creating patios that will get those creative juices flowing. Create a warm, cozy atmosphere for these cooler evenings and purchase or make your own stylish fire pit. Position comfortable chairs around the pit so friends can gather around. Fire creates a relaxed, moody ambience and is perfect for warming outdoor spaces. place. 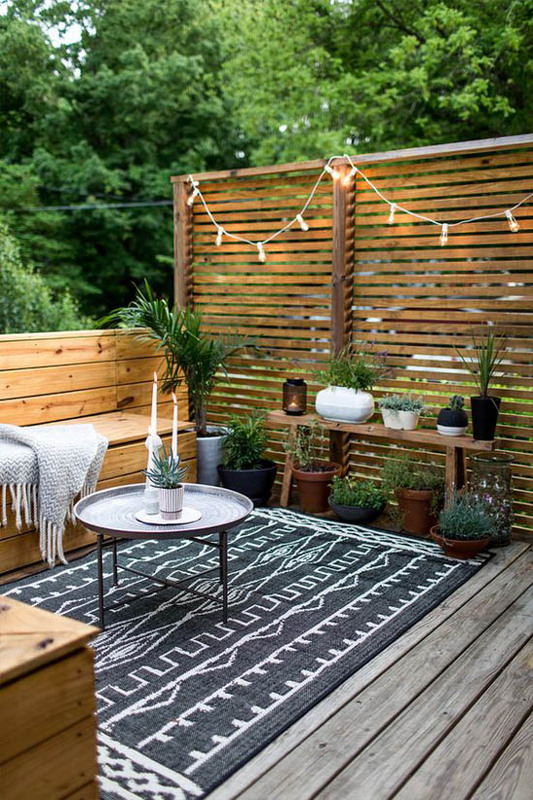 Add some string lights for extra sparkle to your patio and porch. 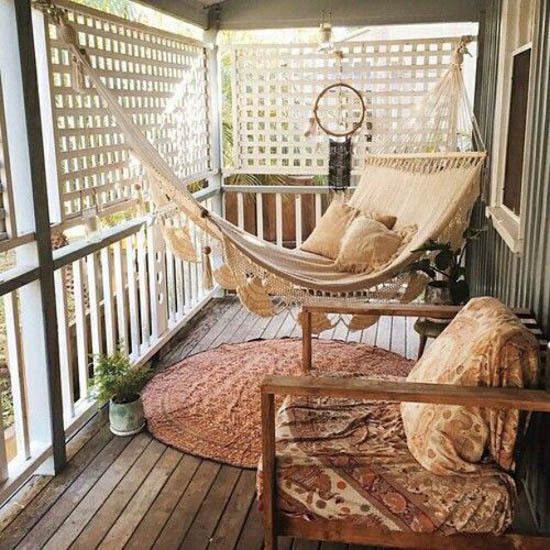 Add a pine table and some comfortable wicker chairs. Upholster cushions in an outdoor fabric that blends in with the colour scheme of the home. This type of setting is perfect for early-morning breakfast or weekend brunches. Be rough and edgy with iron! Match up a marble-topped table with some upholstered wrought iron chairs. Add wrought iron pendant lights or candle to create a high-end urban feel. Furnish your patio with pots or planters that blend in with your overall theme. Plant up pots with evergreen foliage and lots of flowering colour, choose colours that blend into an overall theme. Plants and trees strategically placed in pots can soften and relax a space and cool it dramatically on a hot day. 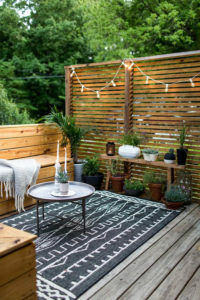 You can accessorise your porch with comfortable chairs & colourful upholstered cushions, smaller tables, themed pots and plants and lighting to set the mood at night. The key to a creating a harmonious porch and patio is a single theme that is stylish, flexible, and comfortable. If you have a porch and or patios, designing and styling them should be a cinch using the creative ideas we’ve collected for you below. Take a look at our Pinterest Collection for more design inspiring porches and patios. Follow Inspirations – Sue Bampton’s board Patio & Porch Ideas on Pinterest.